Home > Marketing > How do I create a coupon? Q.How do I create a coupon? 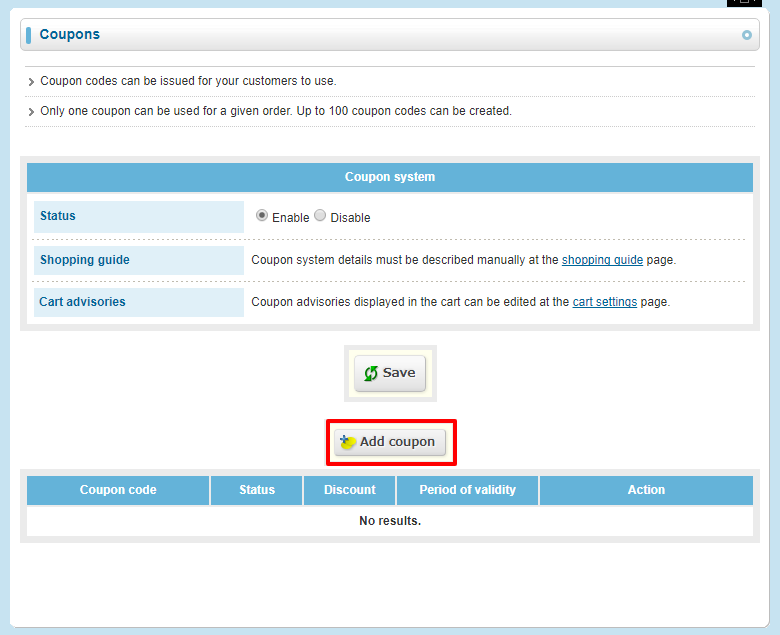 To create coupons, first you need to enable the coupon system. Navigate to Orders → Coupons. In the Status field, select Enable and click (Save). Next, on the same page, click Add coupon to go to the coupon registration page. On this page, enter a coupon code. This is the code that your customers enter on checkout to apply the coupon. Please note that it is case sensitive, i.e. 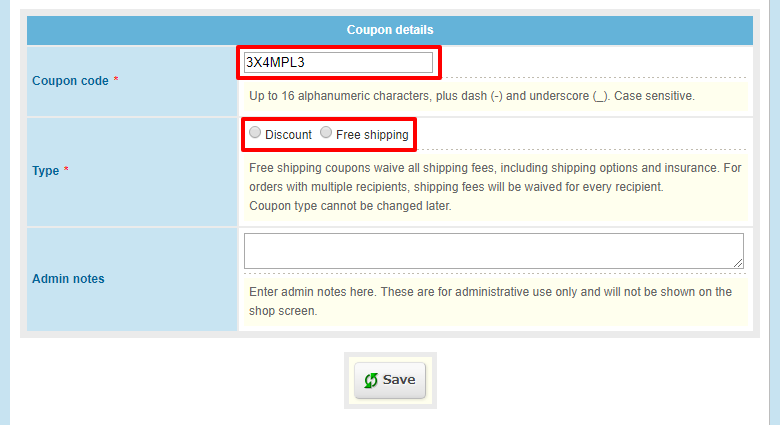 a coupon with the code 3X4MPL3 will not work if a customer enters 3x4mpl3. Next, select what type of coupon you want this to be. You have two options: Discount and Free shipping. Selecting either of these opens more fields on the page. Discount coupons apply a discount to the whole purchase. The fields that appear when you select this option are as follows. Please note that discounts are applied to the item total, and do not include tax or shipping fees. Restrict items Select whether this coupon can always be applied, or only applied when certain items are in the cart. When restricting by item, you can select whether you wish the restriction to be Inclusive or Exclusive. Inclusive restrictions require at least one of the specified items to be in the cart in order for the coupon to be applied, whereas Exclusive restrictions require that none of the specified items be in the cart for the coupon to be applied. Discount Set how much of a discount the coupon will give. You can set a Percent discount (e.g. 10%), or a Fixed discount (e.g. $5). When selecting a Percent discount, you can set a maximum discount value (e.g. $20). Limit item total Set limits on the total purchase value of orders this coupon can be applied to. If the value of items in an order is out of the range you set, the coupon cannot be applied. Period of validity Set limits on when this coupon can be used. Use with points Select whether customers using this coupon can spend points on the same order. Issue points Select whether purchase points should be issued for orders that use this coupon. Usage limit Set how many times one customer can use this coupon. 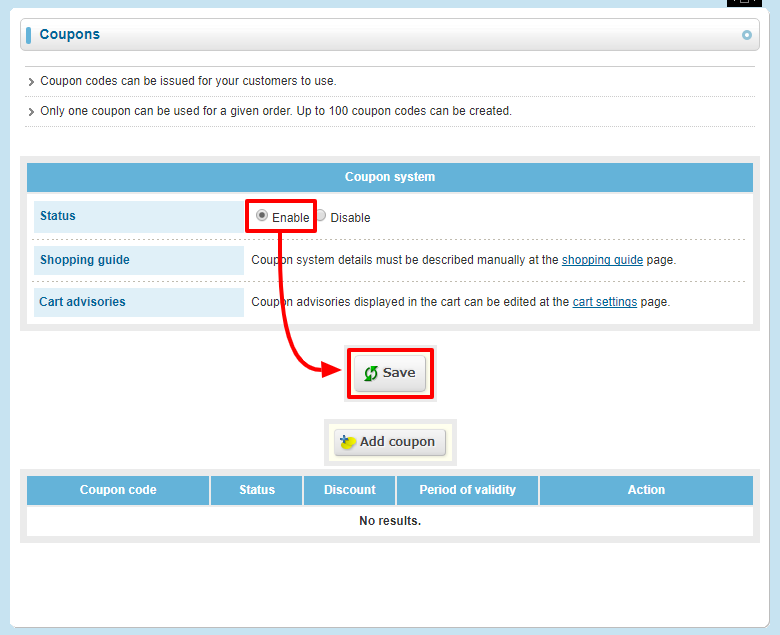 Customer limits Select whether all customers can use this coupon, or only specified member groups. Admin notes Write notes to yourself about this coupon. Once you're done setting up your coupon, click (Save) at the bottom of the page. Customers will be able to enter the coupon code during Step 4 of checkout.